Atiu is located 187 kilometres north-east of Rarotonga. Fly direct to Rarotonga from Sydney return with Air New Zealand from $750 (airnz.com.au) then fly to Atiu with Air Rarotonga from $338 return (airraro.com). On my first afternoon in Atiu a young couple drove up to me on a moped demanding to know how many tourists arrived with me from Rarotonga. If there were at least four tourists on Atiu, the island’s restaurant would open, they said. Welcome to Atiu, an island of 400 peaceful Polynesians, one general store, two schools, 50 beaches, 2000 pigs, 5000 chooks and a couple of horses. Oh, and one restaurant. Atiu may be less than half-an-hour’s flying time from Rarotonga but it still receives barely 400 visitors a year. Home to a handful of simply furnished bungalows and homestays, I’m told that if I see another motorbike at any beach, I best move on. 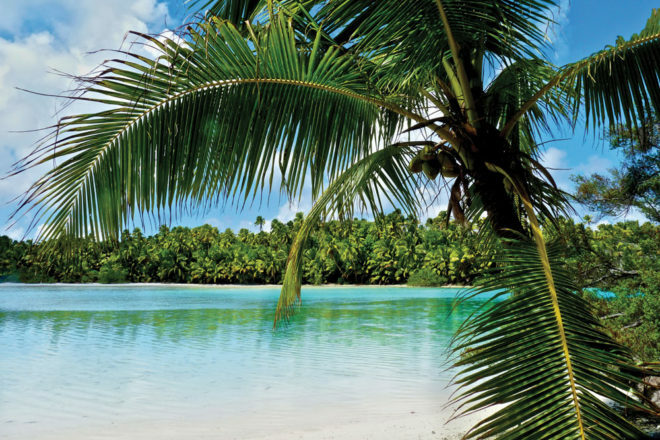 “We don’t like crowds on Atiu,” locals warn. Locals are impossibly friendly; one evening I lose my way back to my bungalow and knock on the door of a random house – the homeowner rides his motorbike with me till I find my accommodation. The island is home to some of the Pacific’s rarest bird species, and bird watching tours with colourful local identity Birdman George are compulsory – he is employed to bring several endangered species such as the Rarotonga Flycatcher back from the brink of extinction. Drop into a bush tumunu. All over Atiu informal ceremonies take place each day and involve the drinking of locally brewed bush beer. You’ll find out more about local culture at one of these than on any island tour. It’s best to avoid the wet season from December to late March.